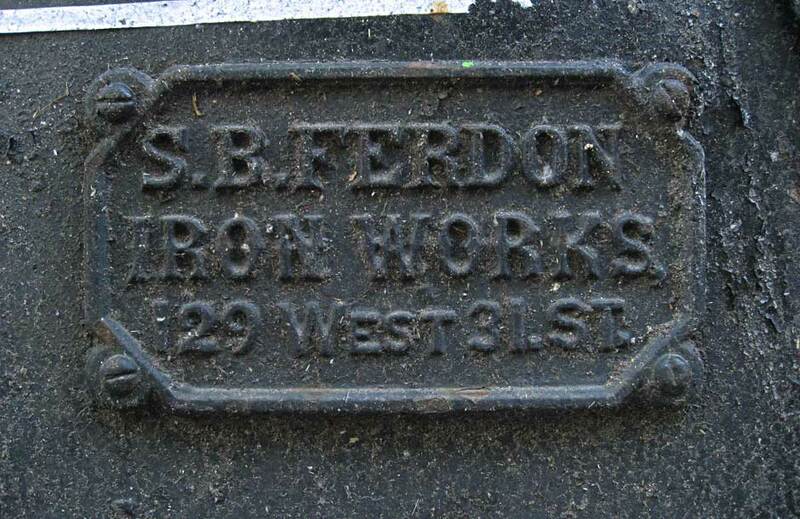 S. B. Ferdon / Iron Works, / 129 West 31 St.
Samuel B. Ferdon (1826-1905) was a blacksmith in New York City from as early as 1850. He can be traced through four U. S. Census reports from 1860 through 1900. In the 1860 census his birth place is recorded as Schraalenburgh, New Jersey. Schraalenburgh appears to be the present day Dumont in Bergen County, New Jersey. In the 1880 census Ferdon lived at 336 W. 12th St., Manhattan. His family consisted of his wife, Sarah, and three sons. Of the three sons, two, Henry and Edwin, had wives who formed part of the family. There was also one grandson. By 1900 he lived, retired, age 73, in the home of his son, Edwin Ferdon, in Hackensack, New Jersey. This census gives his date of birth as Sept. 1826. Ferdon was a member of the General Society of Mechanics and Tradesmen of the City of New York. At the time of his death, 19 Feb. 1905, a notice appeared in the New York Times honoring Ferdon who had been a member of the society for thirty years. Ferdon is described in the Genealogical History of Hudson and Bergen Counties, New Jersey, by Cornelius Burnham Harvey (1900) as the son of Henry Ferdon (born Schraalenburgh, March 10, 1790, died February 27, 1855, married , August 2, 1814, Effie Banta). "She [Effie Banta Ferdon] was born March 22, 1795, and died August 27, 1879. They left issue, among whom were Samuel B. Ferdon (8), who married Sarah M., daughter of Daniel and Rachel Christie, and had issue, among other children, William Scott Ferdon of the ninth generation." The "house smith," business, i.e., iron foundry, was located at 129 W. 31st St. from 1868 to 1896. During part of this time (1868-1876) he had a partner, William Scott, and the business was called Ferdon & Scott. Ferdon & Scott began earlier (around 1854) at 83 W. 31st St. They moved in 1868 to 129 W. 31st St.
His partner of 20-some years, William Scott (1826-? ), was a native New Yorker. Like Ferdon, William Scott can be traced through four U. S. Census reports from 1860 through 1900. In 1900 he lived on Central Ave., Hempstead, Long Island, and continued to give his occupation as "House Smith" as he had in 1870 and 1880. The relationship between the two men must have been close. Ferdon's youngest son was named William Scott Ferdon. The Ferdon cast iron at 12 Wooster St. consists of a one-story shop front on a brick building (click for image). S. B. Ferdon is described as follows in New York's Great Industries, Historical Publishing Company, New York and Chicago, 1885: "Samuel B. Ferdon, Iron Works, No. 129 West 31st Street - This business was established in 1853 at the above address and has always enjoyed a prosperous career. Iron fronts for stores and commercial buildings, beams, girders, stairs, skylights, shutters, doors, guards, railings and plain and ornamental iron work of every description are manufactured from the very best material and in the most thorough manner. The works are spacious and every facility is at hand for the execution of the largest orders. Many fine specimens of this establishments work can be seen throughout the metropolis, and its products have a standard reputation among our leading contractors and builders. For thirty years Mr. Ferdon has succeeded in steadily gaining favor and patronage." The 1880 United States Census (non-population schedules) recorded S. B. Ferdon as owning $15,000 of real capital and $17,625 of raw materials. It employed as many as 20 men at annual total wages of $15,000, and that year it produced iron worth $39,404. The company paid $2.00 per day for skilled workers. The foundry's power was supplied by one steam engine with one boiler producing 10 horsepower. The Minutes of the Board of Estimate and Apportionment of the City and County of New York, 1888 (a google book) records S. B. Ferdon as providing $400 worth of iron ladders to the city of New York.